1972 Pontiac GTOs. Lot 47 of 49. CLICK-> Cameo White 1972 GT/Sport LeMans convertible, right front view with top up. CLICK-> Gold 1972 "GTO" convertible owned by Trent Heyman from New Haven, Ohio. This was our Picture Of The Week for 10/20/02. This car has 51,000 original miles, a 455 engine with Edelbrock heads, and a TCI 400 with a 12-bolt and 3.73 posi. CLICK-> Gold 1972 "GTO" convertible, left front view. CLICK-> Gold 1972 "GTO" convertible, right rear view. The rear spoiler has 455 HO decals on the ends. CLICK-> View of the big hood on this gold 1972 "GTO" convertible. CLICK-> Pat Brown has a Lucerne Blue 1972 GTO hardtop and a Cardinal Red 1972 GTO convertible clone. This was our Picture Of The Week for 6/20/04. His Lucerne Blue hardtop was our Picture Of The Week back on 6/10/03. Click here to see more pictures of it. CLICK-> Another view of Pat Brown's Lucerne Blue 1972 hardtop and a Cardinal Red 1972 GTO convertible clone. CLICK-> Springfield Green 1972 LeMans hardtop owned by Greg McDonald from Canada. This was our Picture Of The Week for 10/6/05. He bought the car in 2000 for $5,000. He put in a 400ci engine. This awesome shot comes in two desktop wallpaper sizes; 800-600 wallpaper and 1024-768 wallpaper. CLICK-> Springfield Green 1972 LeMans hardtop with Greg? CLICK-> Springfield Green 1972 LeMans hardtop, right front view. This one has a green painted top. This is known as two tone paint. CLICK-> Springfield Green 1972 LeMans hardtop in line at the drag strip. Or is this Greg? 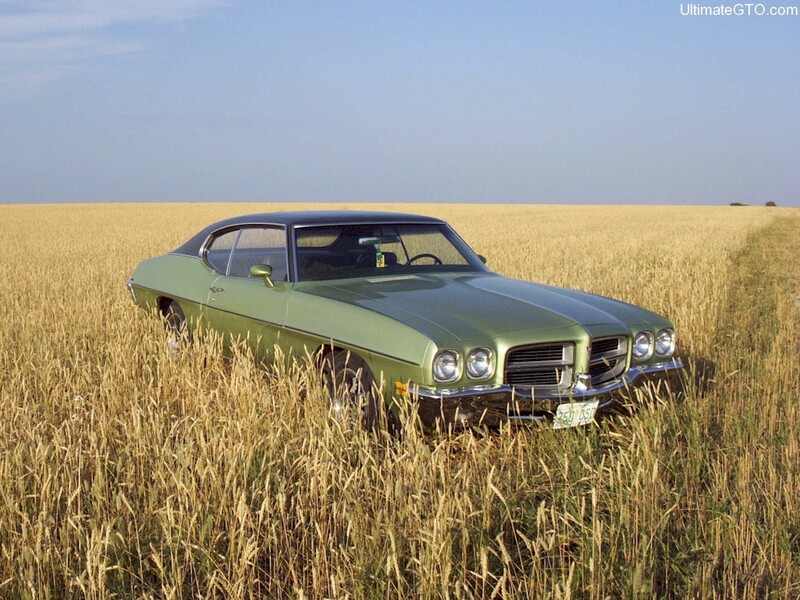 CLICK-> Springfield Green 1972 LeMans hardtop, right side view. 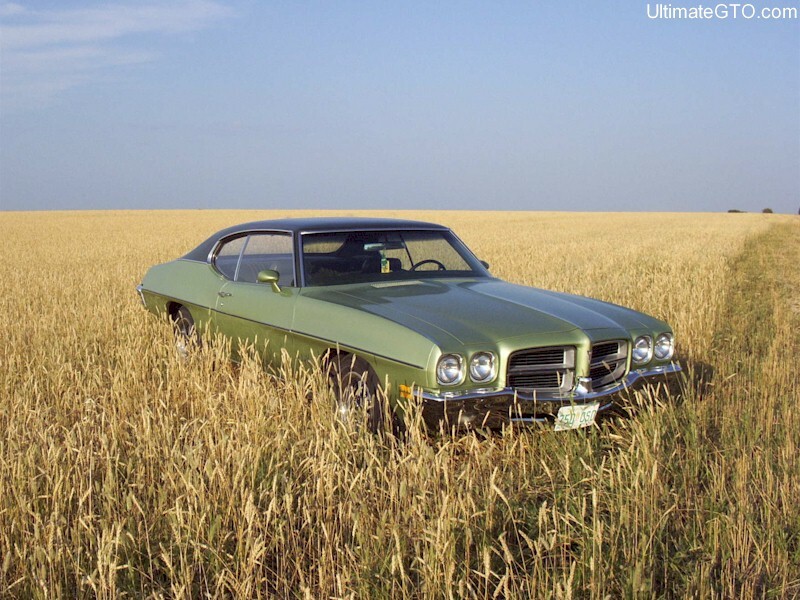 CLICK-> Omaha Orange 1972 GTO hardtop owned by Joe Lennox. This is our Picture Of The Week for 4/9/06. Joe had this story to share, "I bought this car several years ago from a guy who used to bracket race it. He got married, and the wife wanted the car gone. The guy put the for sale sign in the window, but couldn't bear to put it on the street, so it sat in his back yard with the sign in the window for several years. Eventually I got word that there was a 72 GTO for sale, made the guy an offer, and voila! The car has a built 400 out of a 70 Goat. It came with the original engine disassembled as well. It has a rebuilt Turbo-400, and a 3.55 Safe-T-Track. The car has a pretty hot cam, mild head porting, roller rockers, headers, a Flowmaster exhaust system, a custom shift kit, and a high stall speed torque converter. The car is fast, and a blast to drive." This shot would look great as your desktop wallpaper; 800-600 wallpaper and 1024-768 wallpaper. Joe's Dad, Chuck, has a 1967 GTO painted at the factory in this special shade of orange. CLICK-> Another shot of Joe's Omaha Orange 1972 GTO hardtop at sunset. 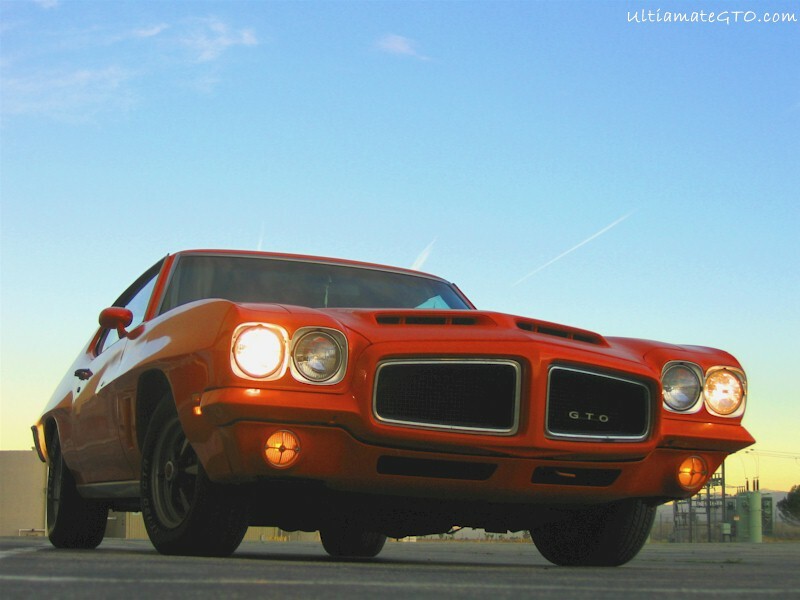 CLICK-> Omaha Orange 1972 GTO hardtop, down low.